I’ve been a bad boy, and made a lot of alterations to Wooly, that the factory never dreamed of. Firstly I added some LED lights up under the lip of the dash, so that I could see the switch knobs etc. at night. LED strip, before being cut into two sections. Theze LEDs come in metre strips and are cut to length, of 50mm per section. Photo of one section of LEDs screwed under the dash lip, looking up. The next photo is the LEDs with power applied. 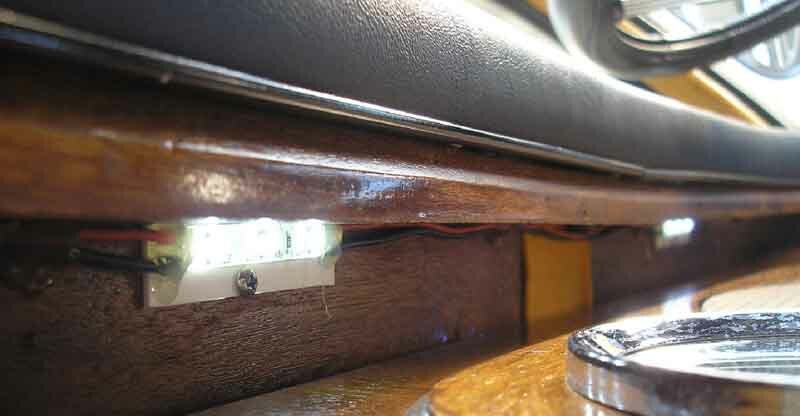 The LED strips have a self sticking back, so I stuck them to bits of plastic, which I then screwed to the wooden underside of the dash. Unfortunately I couldn’t take a good photo of the lights at night, showing the effect. All that came out is the bright spot on the dash. I fiddled with the brightness and "turned" it down quite a bit, by inserting a 1k8 resistor in series with the LEDs. Now has adequate lighting, without being too bright. With winter upon us, I found that the windows were fogging up, particularly the rear window. So, I bought a rear window demister, actually branded as a defogger. I can now see out the back.